Manufactured with our exclusive calandered fabrics inside our plant available in different designs, weights and construction. Cloth fixing is not a problem anymore. Alternative solutions as wiring to tie the eyelets are obsolete. Adjustable Casfil plastic straps are made of flexible plastic material being reusable thanks to its resistance and durability. 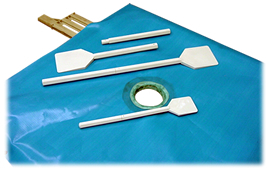 Auxiliary polypropylene tool to securely discharge impregnated cakes without damaging the cloth. Ease manual cake discharge and don't damage the cloth. Small: for use in up to 630x630mm plates. Medium: for use with 800x800mm to 1500x1500mm plates. Large: for use with plates bigger than 1500x1500mm.